Nearby building work taking place from mid March - end of August 2019. Please phone for more details. 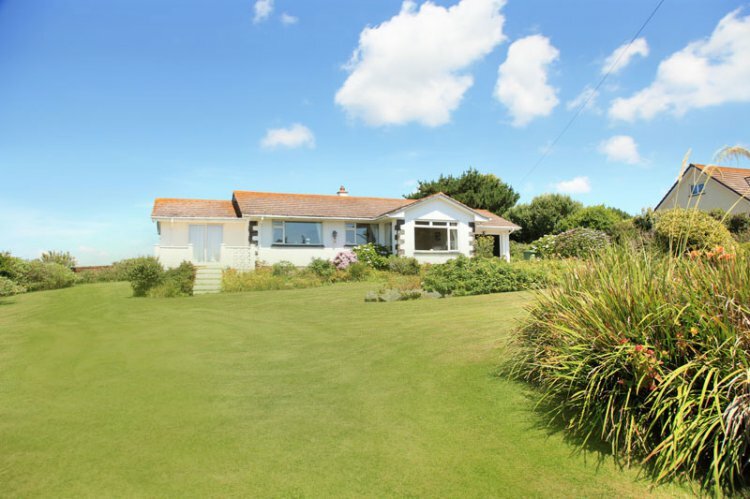 Sea Breezes is a modern detached bungalow set back off the road, situated in its own large gardens with sea views both from the property and the grounds, only a few minutes walk from the coastal footpath and the sandy beach at Polurrian Cove. Mullion village, shops, post office, restaurants/pubs are only 0.5 mile away, while the Polurrian Hotel and leisure club open to non-residents is just around the corner. dvd player. Permanent wi-fi wireless Internet connection is also included free of charge. Separate book room/snug with sea glimpses and views over the large front garden. Brand new open plan fully fitted kitchen, dining and living area which opens out onto the extensive patio and rear garden. Includes double oven with electric hob, microwave, fridge/freezer, dish washer, breakfast table with seating for 4 and a sunny sitting area with comfortable armchairs. A separate utility room has an automatic washing machine, tumble dryer. Bathroom with toilet, handbasin and bath with shower. Two bedrooms – the main bedroom has sea views, wardrobe, chest of drawers, hairdryer, two bedside cupboards with lamps and a double bed with views over the front garden. The second bedroom is a large double room with two 3’ single beds, wardrobe, two bedside cupboards with lamps and views over the rear garden. The front and rear gardens are quite extensive and private with sea views from both. Stocked with many mature native Cornish plants they provide a relaxing environment and a haven for wildlife. There is a patio area with patio furniture and views across the bay towards St Michael’s Mount which can be seen from the top of the garden. Telephone for incoming calls. Parking for 2/3 cars on the driveway. No children under 12 years of age please. Regret no smoking and no pets.